Sarracenia ‘Tygo’, a hybrid containing S. flava. Photo Jonathan Gobbi. Tall and slender, elegantly veined and often brightly coloured, Sarracenia is a personal favourite of mine – in front of a good selection of specimens I really have to control myself or I would buy them all. There are currently six of them in my garden, each ascribable to a different species out of the 8 to 11 comprised in the genus – the total number varies as to which authority you refer to, and to how strictly the concept of species is applied. I obviously prefer the lower figure as it makes my accomplishment look more impressive. Commonly known as the North American pitcher plant, Sarracenia is native of the Southeastern United States, with only one species, S. purpurea, extending its range further north up to Canada. Which means that, in the wild, most of them are used to a warm, temperate climate like that of the coastal plains, with lots of rain and hot summers (while S. purpurea can withstand temperatures well below zero and survive heavy snow). Their typical habitat is in open, grassy wetlands where the soil is always watery and sunlight abundant. Unfortunately, these conditions are not compatible with urban development: habitat destruction is seriously threatening the plants in the wild, along with fire suppression, poaching and the trade of cut pitchers for the floristic market (yes, they make bouquets out of them). They used to be very common before, and I imagine the sight of fields swarming with pitchers – as they appeared at the time the first Europeans arrived – to have been a breathtaking one. Native Americans knew the plants and used S. purpurea as a treatment for smallpox, though its effectiveness is highly dubious. The first specimens reached Europe less than a hundred years after Columbus’ landing, and the Flemish botanist L’Obel included a drawing of S. minor in his 1576 treatise Stirpium Adversaria Nova. Then it was the turn of the great botanist and horticulturist Carolus Clausius (the man behind the Dutch tulip craze), who published the first plate and description of S. purpurea – he called it Limonium peregrinum and placed it in the wrong family altogether, with sea-lavender. To his credit, he was working on dried specimens, collected in Canada sometime in the mid-16th Century. It would take another century for live specimens to be available for study: S. purpurea was then sent to Paris by Canadian botanist Michel Sarrazin, who was also the first to use the current name – looks like he named it after himself. 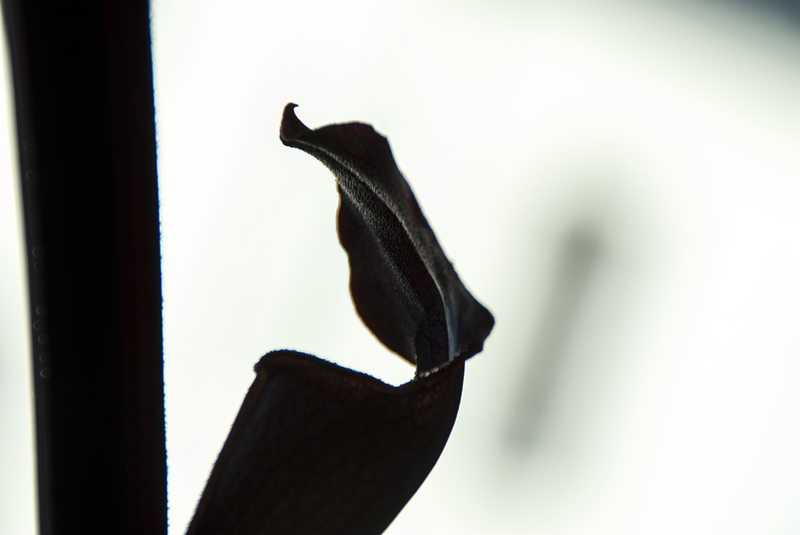 Linnaeus picked the name in his Species Plantarum (1753), and so Sarracenia it is. 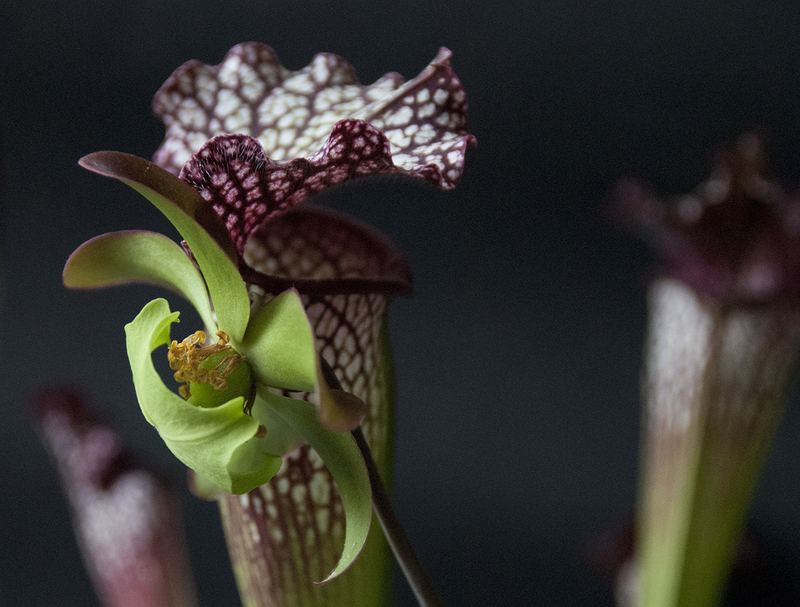 Sarrazin knew that Sarracenia trapped and ate insects, but his opinion wasn’t accepted until the late 19th Century, when Darwin’s discoveries made it clear that plant carnivory was a real thing; yet Darwin mentions them only in passing in his Insectivorous Plants, and it was Joseph Mellichamp to dispel all doubts about their dietary habits, in 1887. S. alata ‘Black Tube’. Photo Jonathan Gobbi. 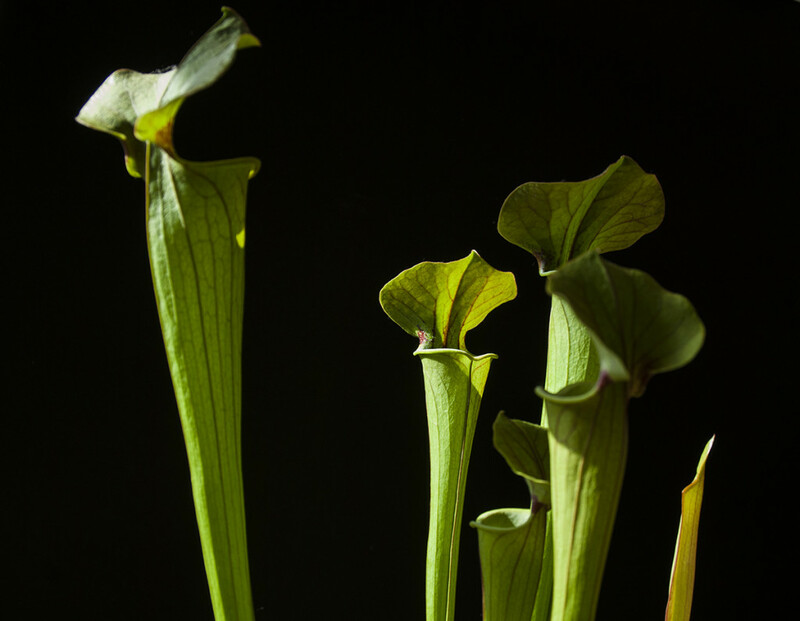 Sarracenia are herbaceous, perennial plants that stem from an underground rhizome; the leaves have turned into tubular, elongated pitchers that look like organ pipes. The pitcher’s opening is directed towards the plant’s centre, and protected from rain and other accidents by the operculum or lid. On the ventral side of the pitcher, a little flap called ala runs all the way up to the opening, where it meets the peristome or lip – the outer rim of the pitcher, usually dewy with drops of sweet, sticky nectar. On the inside, the pitcher’s upper walls are lined with thin, down-pointing hair covered in wax, that result very slippery to insects and prevent them from climbing up again, stinging them between the joints of their exoskeleton. While a large flying insect will be sentenced to death by its own size – not being able to spread its wings, it just gets stuck deeper – smaller insects will be lost by the laws of physics, namely Bernoulli’s principle; this tells us that when a fluid flows in a converging duct, pressure will be lower in the narrower part, and higher in the wider one – in the inverted cone-shaped pitcher of Sarracenia the pressure will always be higher above, and take off of a tiny insect that has fallen in it will prove impossible. 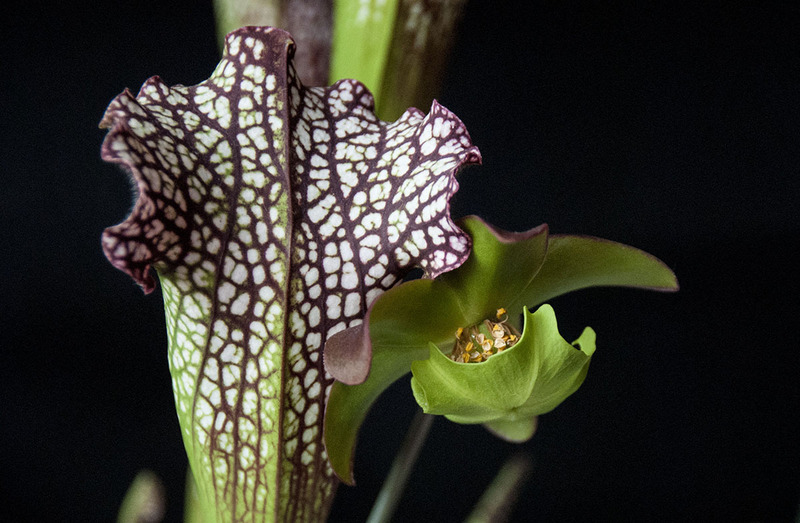 On the outside, Sarracenia pitchers look just gorgeous: their use of vivid colors and intricate line patterns to attract potential prey has the side-effect of making them look pleasing to the human eye, just like flowers – which is what they are actually trying to mimic. The beauty of the pitchers alone would be more than enough reason to cultivate this plants, but it turns out the real flowers are outstanding, too. Each flower hangs upside down from a tall stem, and its shape is complex, to say the least. On the top there are five sepals wrapped around the ovary in the center. From there, a long style stems that is shaped like an umbrella with five points, on which the stigmas are located. The petals dangle between each of these points and can be of many colors, although the majority of them is red or yellow. The particular design of the flower prevents self-pollination, as the pollen gets collected inside the umbrella. It must be said that pitcher plants don’t really need self-pollination as all species are able to interbreed and often do so, giving way to an incredibly diverse range of hybrids, curse and blessing of every Sarracenia lover. S. leucophylla – the flower has lost its petals. Photo Jonathan Gobbi. If you buy a plant in a garden center or florist shop, you can be sure it’s a hybrid – they have been selected to enhance the most desired characteristics, aesthetically and horticulturally: they will be showy and relatively hardy, making them easier to grow. Sarracenia are among the easiest carnivorous plants you can find anyway: they just need lots of direct sunlight and plenty of water. 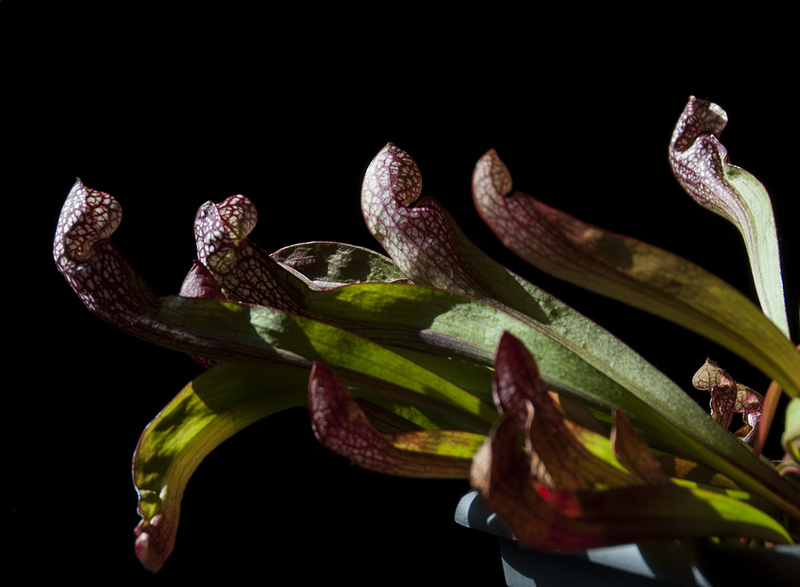 My first Sarracenia was a S. purpurea, a species I normally refer to as ‘the salad’ and whose appeal lies in the bulbous shape of the pitchers, which grow short and fat, with a lid that looks like an elephant’s ear mixed with a seashell – very beautiful. In this species the lid doesn’t close the opening, allowing rainwater to fill up the pitcher and creating a phytotelma, a body of water held by the plant that has its own internal ecosystem and fauna. This can host up to 165 species of inquilines, mainly bacteria, protozoa, rotifera and other little creatures that feed off the plant’s decaying prey. At the top of the pitcher’s food web is the larva of the Wyeomyia smithii mosquito, that reproduces only inside these plants. I suppose that’s what happens in the wild, since I keep my pitchers well watered and have never had mosquito issues, thankfully. I have been able to observe the pitcher’s infauna by connecting a webcam to my microscope, and though the image definition of a kid’s microscope found on the street in Kreuzberg is not that great, I did see some of those rotifera with my own eyes – plus the countless nematodes that live in the soil. I think they should count as pets. Another remarkable species, whose pitchers are not erect but prostrate and that presents peculiar shape and trapping mechanism, is S. psittacina, the parrot pitcher plant. It has a bulbous ‘head’ that curls up, and its pitcher’s opening is very small: insects crawl along the ala and get almost inevitably inside. Once there, they can’t find their way out thanks to an evil adaptation called ‘fenestration’: the pitcher’s walls are spotted with transparent patches that let some light in, but not the insect out, just like window glasses are confusing to flies. The inner part of the pitcher is bristly with long stiff hair that act like a lobster-pot, pushing the victim farther down, to its demise. In the wild plants are very often submerged, and they have been found to capture aquatic creatures with the same nonchalance as terrestrial ones. S. psittacina. Photo Jonathan Gobbi. That said, it’s still the erect species that capture my fancy the most – they are sleek and stylish. They tower high above the smaller species like Dionaea and Pinguicula, and this makes them play an essential role in the visual rhythm of the garden. In this sense, one of the best species is certainly S. flava, also known as the yellow pitcher plant because of the yellowish tint of its pitchers and the color of its flowers. I haven’t seen flowers from my own plant yet – I bought it less than a year ago – and I don’t know if I want to, since I understand they smell strongly of cat pee. What amazes me the most about this plant is the pitcher’s architecture: very large and wide at the top and really tiny at the base, it’s almost incredible that it is nevertheless solid enough to support itself. S. flava is also thought to secrete a substance called coniine, that paralyzes insects and makes them fall straight into the trumpet. S. oreophila is also interesting: almost extinct in the wild, this plant grows at higher altitudes, on the Appalachian Mountains. Its main distinctive trait are the non-carnivorous leaves, or phyllodia: grown by the plants only in winter – when light intake is to be maximized – they are crescent-shaped and gently complement the verticality of the pitchers. It is a really strong plant: mine survived mail shipping, months of light deprivation, and a fall that smashed the pot. But my favourite will always be the magnificent S. leucophylla, perhaps the gaudiest of them all – its upper part of the pitcher is fantastically white, with or without the company of other colors, depending on the hybrid. Mine has a definite red veining that turns into shocking pink in full sunlight (and it has more than a hundred pitchers at the moment), but the next step will be to get a fully white variety, like Sarracenia ‘Hurricane Creek White’, a clone from a strand of S. leucophylla var. alba that doesn’t exist in the wild anymore – it’s so white it’s blinding. As for the ‘pure’ species, my next purchase will be the curious S. minor – a plant whose lid is curved and covers the pitcher’s opening like a hood. They are definitely the most anthropomorphic of all pitcher plants, and a clump of them looks like a group of people engaged in some mysterious conversation – they could be gangsters or police informants, sneaky and shady as they appear. I am not the only one to see human traits in the plants – after all, pitchers have lips and even throats – but still I don’t talk to them, I swear. Occulto. We need some disciplines in here. ISSN 2196-5781.